Tex Avery is the only animation director whose very name defines a genre of Golden Age Cartoons. His cartoons guarantee a calculated insanity, anchored in a sense of reality. His no-holds-barred, anything-for-a-laugh gags shape the Avery Universe, a place unlike any other. He began directing at Warner Bros. in 1936 and stayed until 1942, where he created the Bugs Bunny persona we know today. 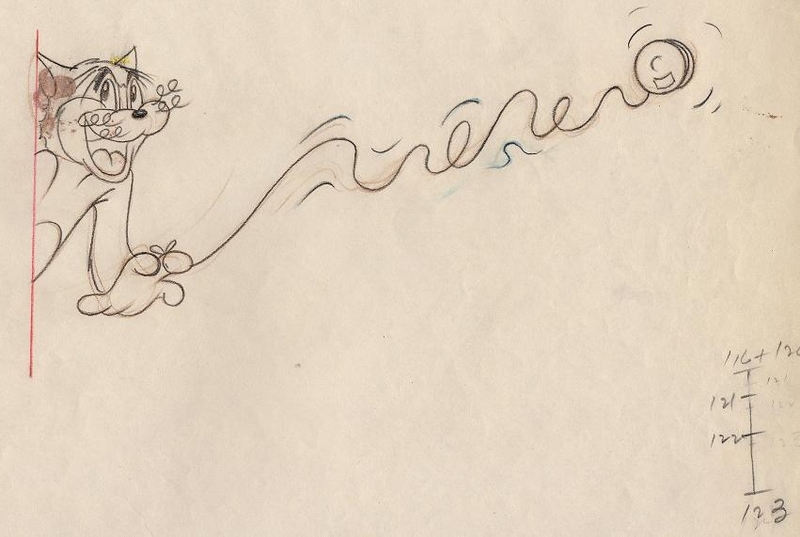 Tex Avery came into his own at MGM, where he directed more than 60 cartoons through 1955, and created such characters as Droopy, Wolf & Red, and Screwy Squirrel. He is also responsible for some of the greatest one-shot cartoons ever made, such as 'King-Size Canary', 'Symphony in Slang', 'Bad Luck Blackie' and the wartime classic 'The Blitz Wolf. #M12 - 'Tom', Mouse Cleaning (1948). #M13 - MGM - 'Flirty Birdy', (1945). #M13 - MGM - 'Flirty Birdy', 1945. The drawing is rendered in graphite and red pencil measuring 5.75" X 4.50", bearing production number 129SC5. Thomas is ready to munch a Jerry sandwich when an eagle comes by and takes it away. Jerry goes back and forth in this one until Tom dresses up as a female eagle to get Jerry back. The eagle goes goo-goo over Tom and gets kissed by suction cup/plunger. There is a lot of hammering. Mr eagle finally offers Jerry as a wedding ring and ,after Jerry ties him up, Tom is carried off to the nest to hatch eggs and knit. #M11 - Tex Avery - Droopy, 'Senor Droopy', (1949). #M11 - MGM - Tex Avery - 'Senor Droopy', 1949. The production drawing of 'Droopy' measures 5.00" X 5.50". The drawing was rendered in graphite and red pencil, bearing numerous notations. The stamped production numbers are, 1 85 SC 7 1. Droopy wins the bullfight and gets his (live-action) girl, actress Lina Romay. 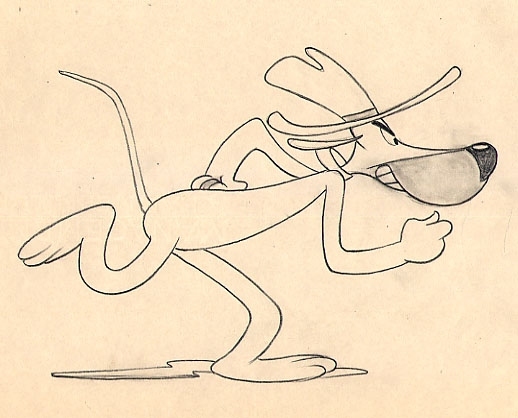 The last collaboration between director Tex Avery and animator Preston Blair. #M15 - Tom - 'Zoot Cat', (1944). #M15 - Hanna Barbera - 'ZOOT CAT', 1944. 'Tom' is drawn on a full sheet rendered in graphite, brown and red pencil. The image size measures 6.50" X 2.75" bearing number 122 in right corner. Graphite animator notes are also written on right center. The Zoot Cat - (7 min. 3 sec.) 1944 Jerry is given as a gift, by Tom, to his female cat friend. But the young cat rejects Tom,s gift...I guess Tom is considered a bit of a square. He overhears the radio talking about a Zoot Suit so he cuts out a costume, really starts to swing, and completely seduces the young thing...he talks like Charles Boyer. Jerry then puts a heap of matches between Tom's toes and then starts to dance with tom's girl. Tom gets sucked up a window and thrown into a fishbowl where his suit shrinks to Jerry size. Zoot Mouse! #M16 - Tom, 'Zoot Cat', (1944). #M18 - Screwy Squirrel, 'Screwy Truant', (1945). #M18 - Metro-Goldwyn-Mayer Studio, SCREWY TRUANT, 1945. 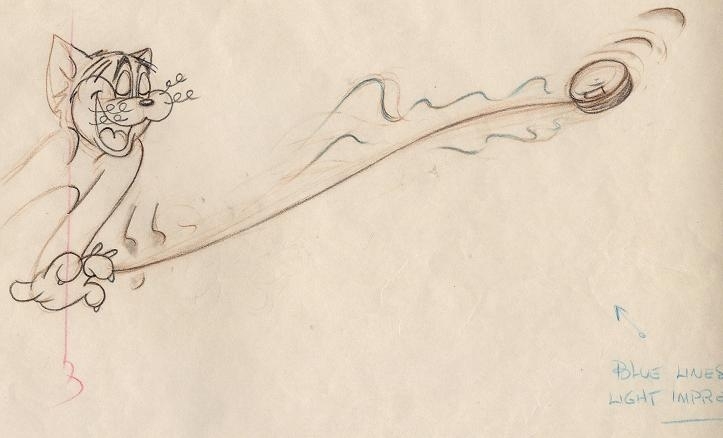 Lively original animation drawing depicts 'Screwy Squirrel', star of four of Tex Avery's MGM cartoons. It is a final animation drawing created by an animator in production of the animated cartoon directed by Tex (Fred) Avery during his peak years at MGM, and a cel was made directly from it. Drawn in pencil on an untrimmed animation sheet, the art measures 1.00" x 1.50". 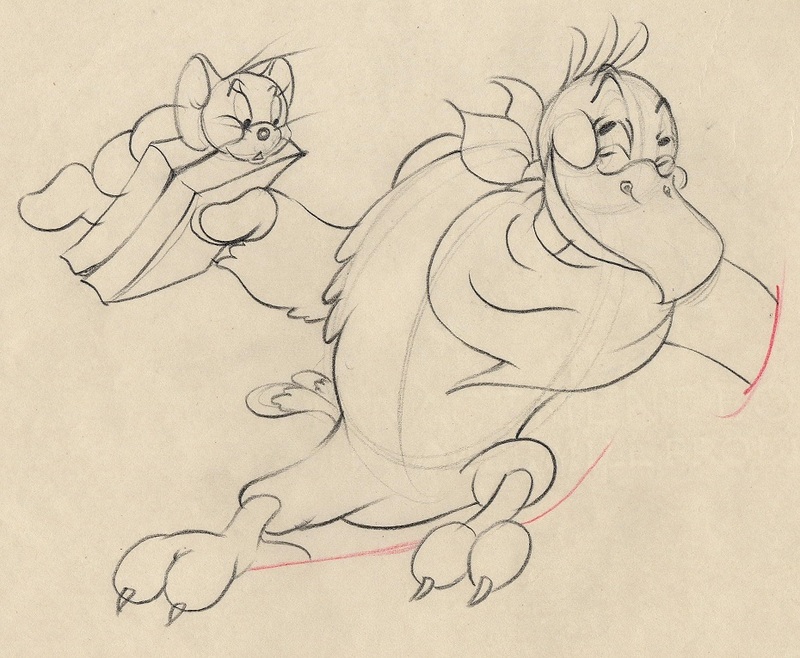 The animator wrote the number '10' to indicate this drawing's place in the scene, and the sheet also bears the MGM stamp that denotes the production and scene numbers. In excellent condition showing only light handling from the animation process itself. COA provided by Howard Lowery Gallery. It's school time at the Little Red (Red is scratched out because the building is blue) Schoolhouse. The truant officer dog finds Screwball at the fishing hole and goes through a bunch of antics trying to find out why Screwball is a truant today. #M19 - Meathead, 'Screwy Truant', (1945). #M19 - Metro-Goldwyn-Mayer Studio, 'SCREWY TRUANT', 1945. Full-figure original animation drawing depicts the 'Truant Officer' (Meathead), in this film playing the role of a truant officer, who stars with Screwy Squirrel in three of his first four cartoons. 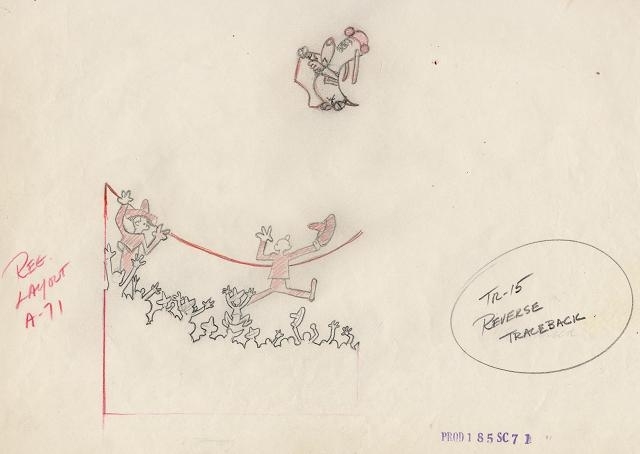 It is a final animation drawing created by an animator in production of the animated cartoon directed by Tex (Fred) Avery during his peak years at MGM, and a cel was made directly from it. Drawn in pencil on an untrimmed animation sheet, the art measures 4.75" x 6.75". The animator wrote the number '31' to indicate this drawing's place in the scene, and the sheet also bears the MGM stamp that denotes the production and scene numbers. In excellent condition showing only light handling from the animation process itself. COA provided by Howary Lowery Gallery. #M20 - English Fox, 'Droopy Dog-Out Foxed', (1949). 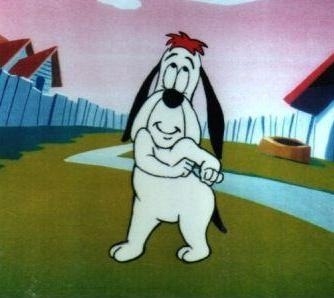 #M20 - Metro-Goldwyn-Mayer Studio, Droopy Dog-Out Foxed, 1949. 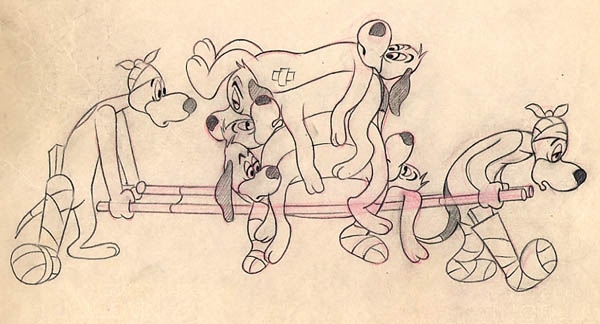 A pack of hounds that met its match in the 'English Fox' is depicted in this animation drawing from Tex Avery's Droopy cartoon. It is a final animation drawing created by an animator in production of the animated cartoon directed by Tex (Fred) Avery during his peak years at MGM, and a cel was made directly from it. Drawn in red and black pencil on an untrimmed animation sheet, the art measures 5 1/4" x 10 1/2". The animator wrote the number '42' to indicate this drawing's place in the scene, and the sheet also bears the MGM stamp that denotes the production and scene numbers. In excellent condition showing only light handling from the animation process itself. COA provided by Howard Lowery Gallery. #M23 - Metro-Goldwyn-Mayer Studio, DEPUTY DROOPY, 1955. Here are two (2) matching original animation drawings of Slim and Shorty, the two inept outlaws in this Droopy Western cartoon, the last cartoon in the series directed by Tex (Fred) Avery during his great period at MGM. They are final animation drawings created by animators in production of the animated cartoon, and cels were made directly from them. The cels made from them appear together in the film. 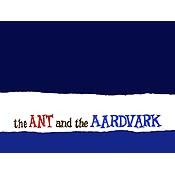 Drawn in red, blue and black pencil on untrimmed animation sheets, the art measures 7.50" x 3.00" and 3 1/2" x 3 1/4". 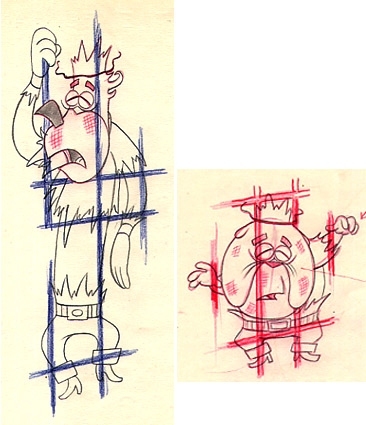 The animator wrote the numbers '10A' and '10C' to indicate the drawings' places in the scene, and the sheet also bears the MGM stamp that denotes the production and scene numbers. In excellent condition showing only light handling from the animation process itself: VERY FINE . Howard Lowery certificate of authenticity is included. Two villains are repeatedly trying to steal gold from a safe in the Sheriff's office, and must do so without waking the sleeping Sheriff. Droopy makes it all that more difficult for them, though. #M43 Metro Goldwyn Mayer Studio, Tom and Jerry - "Mice Follies", 1954. 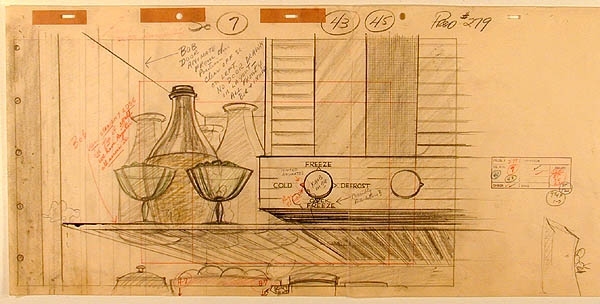 This detailed background layout drawing of the interior of the refrigerator in the house where Tom and Jerry live was created by a MGM Studio artist in development of a scene in the animated cartoon. Drawn in red, green, yellow and black pencil on a 10 1/2" x 15.00" animation sheet, the art measures 9 1/4" x 16.00". 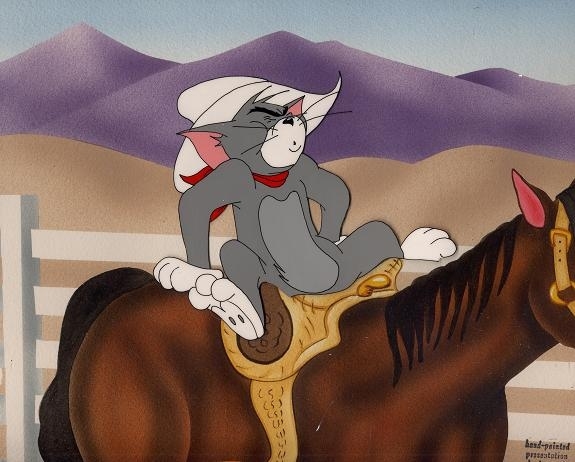 The art was created in development of the background seen in scenes 7, 43 and 45 of the Tom and Jerry cartoon directed by Bill Hanna and Joe Barbera. Two outlines depict positions Jerry will occupy in the scene, and there are numerous notes to the background painter; Studio production stamp with notations appears in the right margin. Vertical fold at center, pin holes, handling: VERY GOOD condition. Howard Lowery Gallery certificate of authenticity is included. Jerry and his young nephew Nibbles flood the kitchen floor with water, then hook up the refrigerator to create an ice pond. Their fun is cut short when Tom wakes up and, seeing the frozen world, takes up skating. The chase is on. #M4 - MGM - Droopy 1980 - Filmation Studios. The cel is on a full uncut sheet, the image area measures. Droopy is a little dog with a slow quiet voice that is very somber. He never does anything energetic until you make him mad. He then becomes abusive and beats up the person that made him upset. #M22 - Junior, 'Henpecked Hoboes' (1946). #M22 - Metro-Goldwyn-Mayer Studio, HENPECKED HOBOES, 1946. 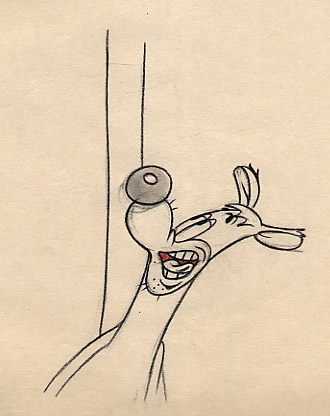 Expressive original animation drawing of Junior, the marginally smarter partner in Avery's comedic team of George and Junior. It is a final animation drawing created by an animator in production of the animated cartoon directed by Tex (Fred) Avery during his peak years at MGM, and a cel was made directly from it. Henpecked Hoboes was the first of Avery's four George and Junior cartoons, and Junior was voiced by Avery himself. Drawn in red and black pencil on an untrimmed animation sheet, the art measures 5 1/4" x 3 1/2". 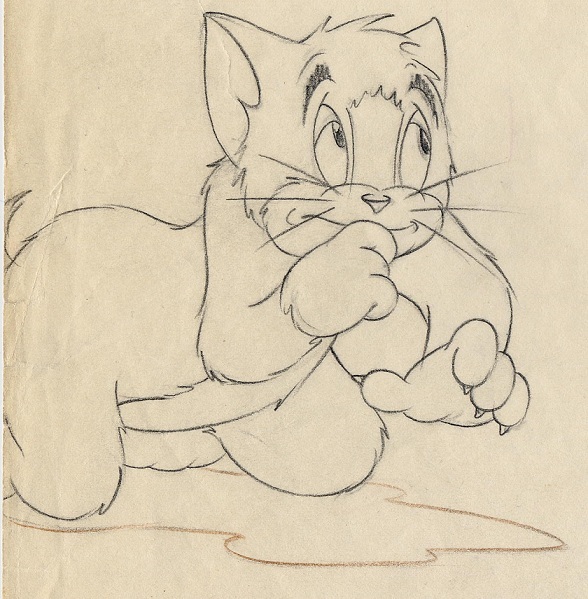 The animator wrote the number '8' to indicate this drawing's place in the scene, and the sheet also bears the MGM stamp that denotes the production and scene numbers. In excellent condition showing only light handling from the animation process itself: VERY FINE. Howard Lowery certificate of authenticity is included. Two hungry hoboes want a chicken dinner. George's plans for catching a hen are constantly sabotaged by Junior's detrimental assistance.